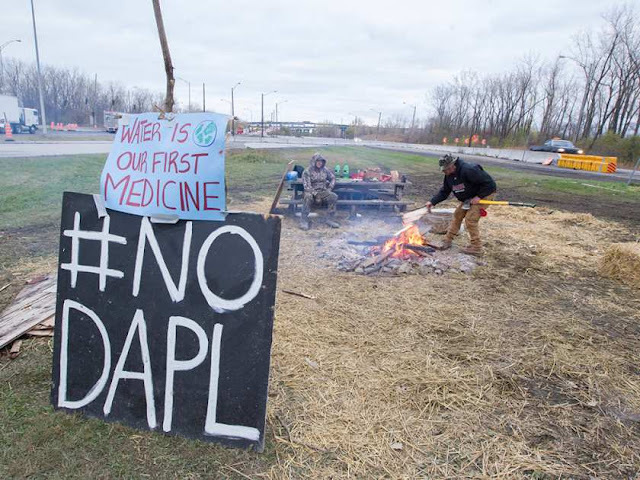 A small group of Kahnawake Mohawks has set up a camp at the base of the Mercier Bridge in support of pipeline protesters in Standing Rock, N.D.
After briefly blocking the bridge over the weekend, a few people sat around a bonfire by the road this morning, with a promise of further action to come. Blair Dearhouse, who has been at the location for the past three days, said the goal is to bring attention to the pipeline protest in North Dakota in a peaceful way. "We're here to protect the planet and raise awareness of what's going on," he said. A teepee has been put up at the site alongside a sign that reads "water is our first medicine." 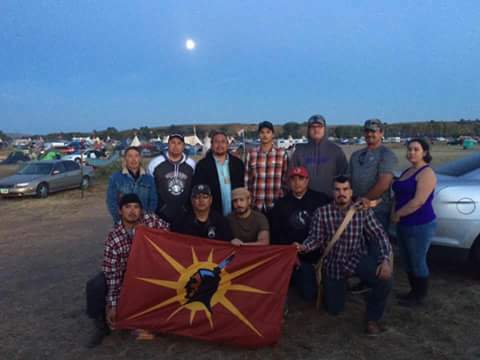 Thousands of people have come to the Standing Rock Sioux Tribe reservation since a group of young people from the community first stood up against the pipeline this past summer. 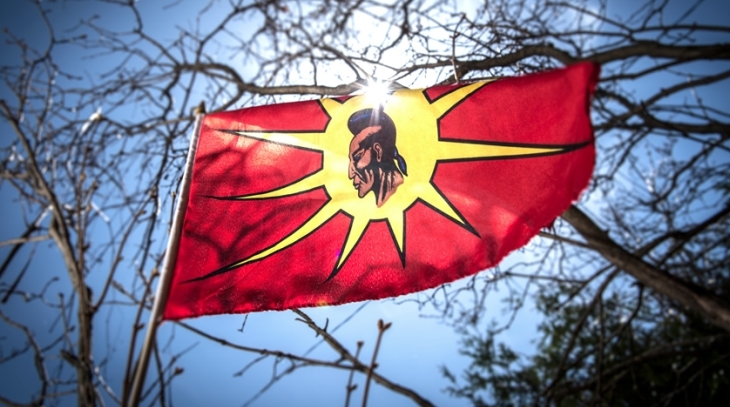 “Mohawk Warrior Flag” was specially designed and employed for the Mohawk Warrior Society. Its red background represents the Red Man, while the prolific yellow sun represents Ro’sken’rakehtekó:wa Tiohkehnéhkha Karáhkwa, our Elder Brother the Sun to which all Rotinonhsón:nimen are closely connected. The final image of a Mohawk man represents the Kanien’kehá:ka men of the Rotinonhsón:ni who are actively prepared to defend and protect its people and territory. There have been over 200 arrests in confrontations with police, which have escalated in recent weeks. For months, Indigenous groups have been protesting the Dakota Access pipeline near the Standing Rock Sioux reservation in North Dakota. On Sunday, Grand Chief Joseph Tokwiro Norton said the band council fully supports the demonstrations near the Mercier Bridge. He said two chiefs from Kahnawake were part of a delegation that took supplies to Standing Rock this fall. "I always look back to 1990, the so-called Oka Crisis, when people from all over North America came here and did what they could to help support us," Norton said. "So it's our turn now to show our reciprocation for things like that." Kahnawake Peacekeepers have been instructed to support the protesters, Norton said. Responses to "Kahnawake Mohawks camp out in support of Standing Rock water protectors"
No puede ser que la industria y la politica devoren las raices humanas ,apoyo a todos los indegenas del mundo para ekkos puedan continuar sus vidas en sus tierras sin intervencion de tecnologias dañinas.